Norwegian starlet Iver Fossum may not be a household name to many yet, but the midfielder has only recently completed a move from his home country to join German side Hannover 96 and is already playing regularly. The midfielder plays with a very continental style and prefers to play in a central role; many expect Fossum to be a long term partner in Norway's midfield with Real Madrid starlet Martin Odegaard. 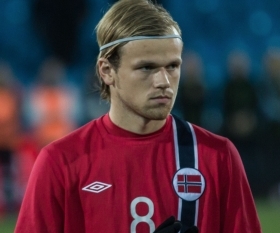 Fossum has played 3 times for the Norway national team and spent his formative years playing for Stromsgodset, where he scored 14 goals in 60 games In 2015 he was the club's top scorer, attracting the interest of Hannover scouts, who made a 3.2 million euro transfer bid and brought the player to Germany on a long term contract. Fossum is an excellent passer of the ball and efficient in his distribution; opting for the simple as opposed to the special in most games. He is a typical box to box midfielder who likes to break up opposition attacks whilst also getting forward into a more creative role. Fossum has had to ordeal a tough childhood though, losing his father at just 14-years-old after he was killed in a car accident. Many in Norway have praised Fossum for the way he bounced back from that. Many in Germany predict that Fossum will be a first team regular at Hannover 96 this season and that big things are sure to come from the player.